CMYK colour model originates from the printing press world and works with four primaries cyan, magenta, yellow, and black (K stands for « key », « key plate » which in printing press carried the black ink). 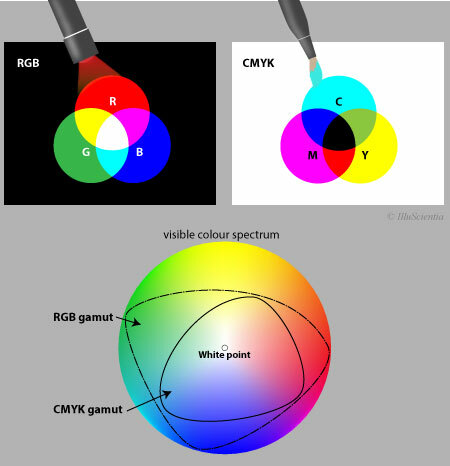 It is a subtractive colour model and hence, in a sense, an opposite of RGB: white is the natural colour of the paper to start with, while black results from a mixture of coloured pigments. As soon as you use colour ink on paper, the pigment absorbs part of the light spectrum which is subtracted from your background and you create a darker outcome. CMYK has a relatively small gamut compared to RGB and hence CMYK colours tend to appear onscreen a bit dull and lifeless. Bright and vibrant colours are difficult to achieve with CMYK. Also, as CMYK refers to physical printing on paper, even with the same CMYK colours the printed image is likely to look different depending on the type of paper it is printed on and its finishing (for example matte versus glossy).